As 2018 comes to a close, it is essential that you use this time to evaluate and review your marketing strategies of the past year. Did you reach your goals? Did you utilize your resources in the necessary areas? Did you experience growth? Or, did you experience loss? Whether you deem your strategies as a success or not, it is the perfect time to begin looking at developing marketing trends to incorporate into your company’s new year’s resolutions. Capitalizing on new tools, technology and tactics will help in creating space for growth, opportunity, and success for you and your company. Take time to evaluate your website content. Adding fresh content will give your website the jumpstart you’re in need of for the new year. Not only does organizing content help with new customers, but it helps keep old customers interested. Thriving companies are transparent on their social media platforms. Keeping your customers in the loop throughout daily life, events and upcoming promotions allow for customer interaction. Likewise, keep your website transparent. Though you don’t have to disclose all the information about your company, your pricing and your staff, know that a competitor in your area is revealing their biggest secrets to gain an upper-hand. Evaluate and clean up your social media platforms by looking for inconsistent content and imagery. Remember that social media should include cohesive branding that is consistent with your website, business cards, and all other marketing materials. What sets successful companies apart from the rest is their ability to remain consistent with branding in an ever-changing, always evolving digital world. Capitalizing on new tools, technology and tactics will help in creating space for growth, opportunity, and success for you and your company. Research shows that social media and website browsers connect more with companies that have rapid response times on both social media and emails. In a world of instant gratification, our customer service must adapt to fit the needs of our target audience. Has your company considered using mediums that are new and innovative to fit the needs of your target audience? When choosing your medium, consider the following: engagement, demographics, reach and performance. Know who you’re trying to engage with and choose the mediums that best fit your company’s needs. Has your company ever considered having an ADA compliant website? Are you unsure of the standards? Is your content accessible to those with visual or hearing impairments? Reviewing your website and capitalizing on these different areas will not only make your company more inclusive, but it also increases your reach exponentially. 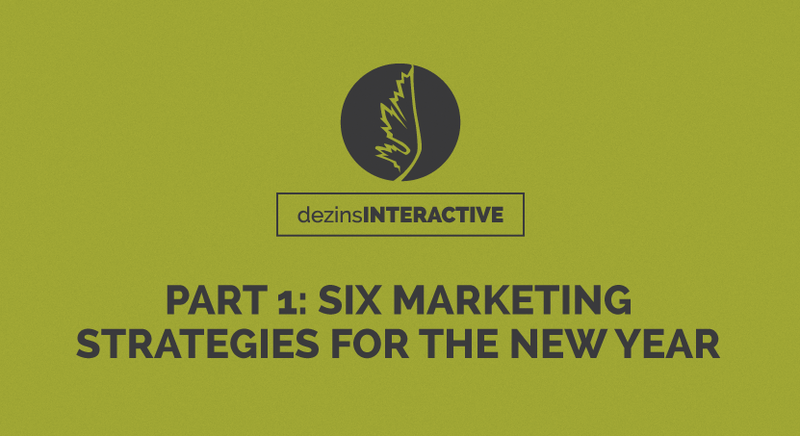 Capitalizing on these suggestions will help maximize your marketing efforts as you go into the new year. If you would like to have a more in-depth conversation, please feel free to call us at (225) 615-8358 or visit us at dezinsINTERACTIVE.com.